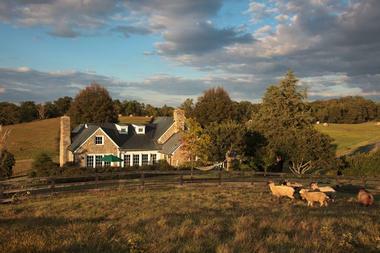 Goodstone Inn & Restaurant is a romantic rural retreat in the heart of Virginia’s wine region. Set on 265 acres of farmland and rolling hills near Middleburg, Virginia and only an hour from D.C., Goodstone Inn will appeal to those who seek peace and tranquility and who value the luxury of elegantly renovated farm buildings and award-winning French cuisine. Goodstone Inn’s charming guest rooms are set in six renovated buildings on a country estate. The inn offers stunning vistas of the Blue Ridge Mountains, plush, comfortable lodgings, tasteful décor and antiques, and all the ease of modern conveniences. All of the inn’s rooms have a coffee maker, a hair dryer, a safe, a flat-screen TV with a DVD player, a fridge, an iron, and complimentary toiletries. Most rooms also have a CD player. The Carriage House is a renovated carriage house and equine stable. A century ago it was used for horses, three carriages, and hay and grain storage in its loft. Today the building houses four elegant suites and rooms. The former loft is now the Hayloft Deluxe Room. Papered in blue and white and featuring a plush queen bed and a comfortable reading chair and ottoman, the Hayloft has a private roof deck that overlooks Goose Creek. The Carlyle Junior Suite has a private entrance, a queen bed, a sitting area with a sofa bed, and spectacular views of the Blue Ridge Mountains. The Mare Suite is decorated in the French country style and has a queen poster bed and views of the courtyard and gardens. The Stallion Queen Suite is equestrian-themed, and it features a queen poster bed, a sitting room with a sleeper sofa, and views of Goose Creek. The Dutch Cottage is a stone building with a weathered copper roof and has two rooms available. Guests of the Dutch Cottage share a charming country living room on the first floor. 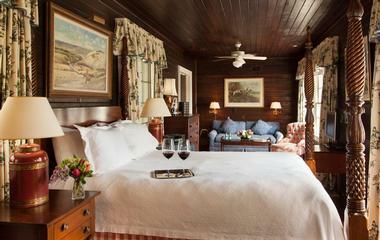 The Delphinium Deluxe Room has a blue English country palette, a carved queen bed, and a panoramic vista of the estate. The Magnolia Deluxe Room is decorated with a French country palette with elegant draperies and furnishings. It features a queen sleigh bed, a claw-foot tub, and windows that overlook Goose Creek. The French Farm Cottage is a luxurious stone building with two-foot thick walls and sweeping views. Inside the cottage are dramatic vaulted ceilings with rough-hewn timbers, and it has a Provencal color scheme. The three rooms in the French Farm Cottage share a living room with two floor-to-ceiling wood-burning fieldstone fireplaces. Every room in the cottage has a jetted soaking tub. The Angus Deluxe Room is decorated in blue and white and has elegant hand-carved furniture, cathedral ceilings, and a queen bed. The Harvest Deluxe Room has traditional French country décor, a plush queen bed, and gorgeous hand-carved furniture. The Leith Room is styled in crisp blue and white, with a queen bed, antique furniture, and cathedral ceilings. The original Manor House has four separate rooms and provides its guests with a large, fully equipped kitchen and a comfortable living room and dining room, both with wood burning fireplaces. There are three second-floor rooms and a ground-floor suite. The Harriman Room is decorated in salmon tones, and it has a queen four-poster bed, an antique vanity table, and a reading chair. The Master Room has a queen four-poster bed, a cozy sitting area with lounge chairs, and a sweeping view of the rolling Virginia landscape. The Mosby Room is decorated in Kelly green with a four-poster canopy bed, 18th century furniture, and oil paintings. The Stuart Suite has a private entrance and an outdoor terrace with a divine view of the Blue Ridge Mountains. Its bedroom has a queen bed, and the sitting area has a pullout sofa and comfortable armchairs. A marble bathroom completes this luxurious suite. 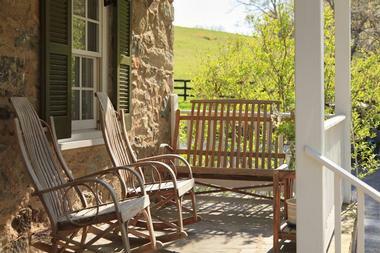 The Bull Barn Cottage is entirely private with just one suite. Vaulted ceilings, rough-hewn wooden beams, and a wood-burning stove beautify this building. The cottage features a king-sized sleigh bed, a sitting room and a library, a jetted soaking tub under a picture window, and a multi-head steam shower with a seat. The Spring House is in a secluded setting nestled amongst meadows next to a natural spring. Its guests can enjoy the fully equipped country kitchen and the comfortable sitting room with a gas fireplace. The Spring House has four rooms and a front porch with rocking chairs. The Ambassador Deluxe Room boasts Old World architecture, stately furniture, crisp yellow décor accented with tartan, and views of the estate. The Goodwin Deluxe Room is embellished with grey and blue tartan, and it features a beautiful Cherrywood queen four-poster bed, as well as a skylight. The Verandah Deluxe Room has a queen four-poster bed, an antique hand-carved armoire, and French doors that open onto the verandah. The Warburg Junior Suite is decorated richly in green and rose and has a queen four-poster bed, a sitting parlour with a sleeper sofa, and French doors that open onto the front porch. The award-winning Goodstone Restaurant focuses on French seasonal cuisine with an emphasis on farm-to-table dining. Much of its menu offerings come from the estate’s farm, which provides the kitchen and estate with fresh lamb, free-run eggs, vegetables, microgreens, mushrooms, orchard fruit, cane berries, cut flowers, honey, and fish from the creek that runs through the property. The Goodstone farm grows no genetically modified food, and they ensure their animals are raised with access to fresh air, clean water, pasture, and adequate shelter. Solely organic fertilizers from compost and manure are used at the Goodstone farm. 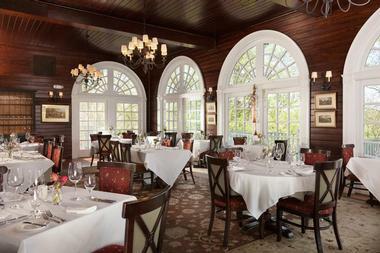 French cuisine and seafood are the highlights of the Goodstone restaurant. The restaurant is open for breakfast, lunch, dinner, and Sunday brunch. Guests can buy delicious picnics-to-go if they wish to eat al fresco, and they can keep the picnic basket afterwards. Spa & Activities The Goodstone Inn’s spa is set in a renovated barn. Relaxation massages, deep tissue massages, and prenatal massages are available. The rural setting of The Goodstone Inn allows for out-of-door adventures for every nature lover. Birdwatching is a popular pastime, and there are nature trails through woodlands and meadows. Bicycle and canoe rental is available. Guests can cool off in the outdoor swimming pool on summer days. 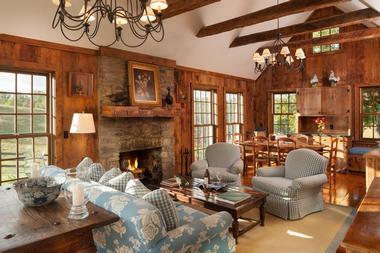 The Goodstone Inn’s spa is set in a renovated barn. Relaxation massages, deep tissue massages, and prenatal massages are available. Goodstone Inn & Restaurant has an event team that can help you plan the perfect wedding. Both buffet and seated dinners are available. The entire estate can be rented for an exclusive wedding, and for those ceremonies of up to 250 guests, the wedding is set near the estate’s pool. Weddings of up to 125 guests take place on the lawn near the French farm cottage. For up to 50 guests, the wedding can be held inside or outside of the manor house. The Goodstone Inn’s event team can provide tables, chairs, cutlery, glassware, dinnerware, and they can also arrange kitchen staff, servers, and bartenders. 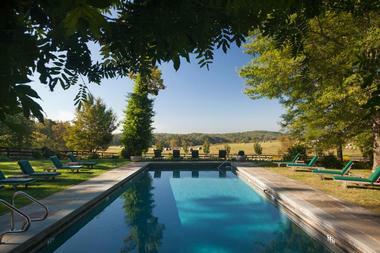 Goodstone Inn is set in the rolling hills of Virginia’s wine and horse country. There are many wineries and a distillery in the Middleburg, Virginia area, and many of them offer tasting tours. The National Sporting Library and Museum is a short drive from the inn, and an excellent zip-lining course is nearby. Room rates start at $310 per night.